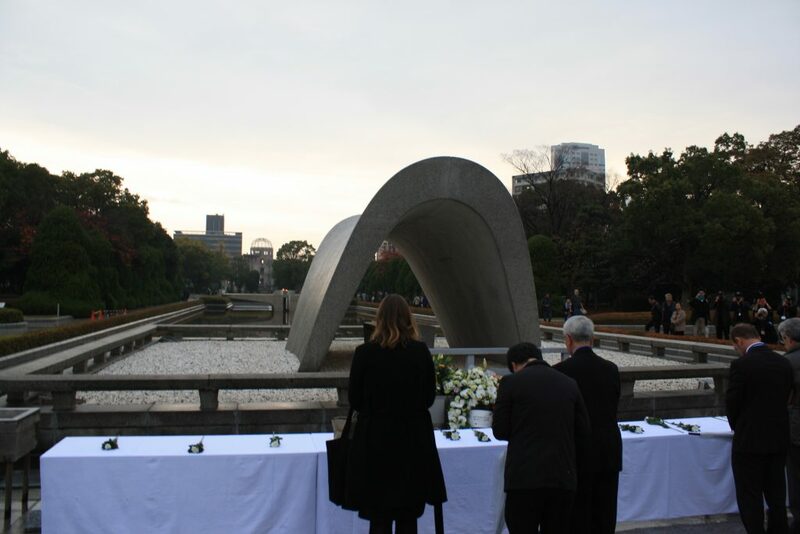 Participants in the 27th UN Conference on Disarmament Issues (UNCDI) in Hiroshima lay flowers at the Cenotaph honoring those who died in the atomic bomb attack. Full Written Remarks by Matthew Bolton, director of the International Disarmament Institute, for Session on “Education for the Next Generation on the Realities of the Atomic Bombings” at the 27th United Nations Conference on Disarmament Issues (UNCDI) in Hiroshima, 29-30 November 2017. I must admit that when asked to speak on this panel, I initially felt awkward about the request. I have no personal experience with the realities of the atomic bombings here in Hiroshima, or Nagasaki. I have not myself suffered the impacts of nuclear weapons testing in the places where I live. However, in preparing for this panel I have been reflecting on how I came to know about the humanitarian and environmental consequences of nuclear weapons. I spent some of the first years of my life here in Japan. Though we left when I was only three-years-old, I still have memories of Tokyo and the friends my parents made there would often visit our home in Leicester, England. As a result, I grew up with a positive regard for Japanese people and so always felt disturbed when history classes debated whether the atomic bombings “ended the war.” I could not so easily dismiss the lives of Japanese people as “collateral damage.” I could imagine people in the casualty statistics. But I also learned about nuclear weapons through the public mobilization for nuclear disarmament. One of my earliest memories of our family’s return to the UK was participating in a march against nuclear weapons in London with my father. Leicester, my new hometown, was proud to have declared itself a “Nuclear Free Zone.” Like many people in Leicester, my parents were members of the Campaign for Nuclear Disarmament (CND) and I remember reading the pamphlets and newsletters as a child. But it was not until the last three years that I feel I have begun to comprehend the realities of nuclear weapons use and testing. I am ashamed to admit that I knew little about the scale of harm caused by nuclear testing in the Pacific by my two countries (the UK and USA). It has been my participation in the advocacy of the International Campaign to Abolish Nuclear Weapons (ICAN) that motivated me to learn. Working with ICAN exposed me to the testimonies of survivors and pushed me to educate myself about the extent of nuclear harm around the world. As I observe my students at Pace University, I see a similar process at work. I teach a class on the Global Politics of Disarmament and Arms Control, which has a service learning component, in which students are placed with disarmament advocacy groups working around the UN in New York. I assign them an extract from John Hersey’s 1946 book Hiroshima; they read the Nuclear Non-Proliferation Treaty and academic articles on nuclear disarmament. However, it is their participation in disarmament advocacy that compels their interest, more than the readings or lectures. For example, two of my students helped an NGO organize a side event at the UN featuring the testimonies of hibakusha. They were transfixed as they listened to the stories of survivors and afterwards conveyed how moved they were to the class. I also noticed that the experience elevated their commitment to engaging with the readings and class discussions. Encountering a few survivors of the atomic bombings in Hiroshima and Nagasaki opened space for my students to empathize and imagine the suffering of victims of nuclear harm and armed violence elsewhere in the world. The best disarmament education is thus participating in disarmament and hearing the stories of those most affected by violence. Of course, there is nothing particularly new about this insight. Pedagogical theorists from John Dewey and Mary McLeod Bethune to Paulo Freire and bell hooks have long argued that education must be a cycle of praxis – of both engaging with the world, as well as reflection on it. We learn, they tell us, through engaging with the public sphere, not just sequestered away in classrooms. Indeed, disarmament policymaking is intricately woven with education. When states establish new multilateral disarmament and arms control norms, diplomats are not simply bargaining mechanically over interests. They are also engaged in learning about each other, about the weapons they seek to limit and the impact such devices have had on people. They also bring to the negotiating table discourses, attitudes and conceptions of the world that are shaped by their own educational background. Diplomats’ understanding of their country’s interests and values is also shaped by the awareness of the public they represent. International humanitarian law specifically recognizes the role of the public conscience in determining which weapons and practices are inhumane. While disarmament education is not specifically addressed in the TPNW’s operative provisions, its ‘positive obligations’ offer an opportunity to engage the next generation in the realities of nuclear weapons. Article 6 and 7 obligate all states parties to assist the victims of nuclear weapons use and testing and remediate contaminated environments. A reinvigorated political focus on humanitarian and environmental dimensions of nuclear weapons will open new possibilities for disarmament education. ICAN’s positive obligations team has begun a process of needs assessment that will be foundational to implementing these provisions. We ourselves have been surprised at the scope and scale of humanitarian and environmental harm from the two bombs dropped here in Japan and 2,000 nuclear tests around the world. In presenting our preliminary findings from desk research at a side event at the UN General Assembly’s First Committee, we found that people who had been engaged in nuclear disarmament diplomacy and advocacy for many years were similarly surprised. This, I think, is the result of discussions about nuclear weapons having been separated from other policy discussions about human rights, development and the environment. But engaging in needs assessment, planning and implementing programs to assist the multiple generations of survivors of nuclear weapons use and testing and remediate environments will place the officials and aid workers in renewed contact with the multiple generations of survivors and affected communities. In engaging with affected communities we can record the stories of those who have struggled with the legacies of nuclear harm and found coping mechanisms to deal with it. Framing nuclear harm as a humanitarian and environmental problem will enable NGOs and international development agencies to engage the public in fundraising and consciousness raising, drawing new audiences. It could draw renewed media interest, endorsement by high-profile people, discussion by Model UN students and incorporation into development and environmental studies curricula. Indeed, implementation of the clearance, victim assistance and risk education obligations in the landmine and cluster munition ban treaties has contributed to much broader public understanding of the consequences of these weapons. By conceiving of victim assistance broadly – not only health benefits and compensation – we can also support affected communities organize, record, transmit and memorialize their experiences for future generations. For example, Moruroa e Tatou, a test survivors’ association in French Polynesia has also established a nuclear testing memorial in Papeete, Tahiti, called Place du 2-Juillet or Te kohu kino. Every year, Moruroa e Tatou holds a commemoration of the first nuclear test in French Polynesia at the memorial. The NGOs Peace Boat and Hibakusha Stories have helped survivors of the atomic bombings bear their testimonies and advocate to students, journalists and diplomats. Implementation of environmental remediation should also include risk reduction education, which can be combined with a broader education about the realities of nuclear weapons. Moruroa e Tatou, for example, produced an informational booklet, Moruroa: La Bombe et Nous (Moruroa: The Bomb and Us), telling their story and warning of the risks of nuclear testing. Robust implementation of the positive obligations will also reveal the global scale of humanitarian and environmental harm from nuclear weapons. In addition to the Japanese citizens, Korean, American, Australian, British, German, Dutch, Indian and New Zealand nationals were exposed to dangerous levels of radiation during and after the atomic bombings of Hiroshima and Nagasaki. Nuclear testing has occurred in 17 countries (Algeria, Australia, China, French Polynesia, India, Israel, Kazakhstan, Kiribati, Marshall Islands, North Korea, Pakistan, Russia, Turkmenistan, Ukraine, USA and Uzbekistan), with fallout spreading to Norway, Sweden and Canada. New Zealand and Fiji nationals also participated in testing. Nuclear weapons related accidents have occurred the Greenland and Spain, as well as in possessor states. Uranium is mined in 20 countries around the world, often with “significant risks to the … environmental and public health” of communities in proximity to such activities, according to research by the Natural Resources Defense Council. Addressing the global harm of nuclear weapons use and testing can open opportunities for solidarity across national boundaries. Learning about the suffering of nuclear survivors close to one’s home may enable empathy for those further away and create possibilities for education about the global story of nuclear harm. By supporting disarmament education, victim assistance and environmental remediation skeptical states can engage with the TPNW in a constructive manner. Indeed, I would humbly suggest that focusing on expanding understanding of and addressing global nuclear harm could offer a way for this state we are into build bridges between supporters of the TPNW and those states that continue to express opposition.